Holland | How Lucky Can Anybody Be? Here’s what a hundred dollars worth of Dutch cheese looks like! Pesto gouda was definitely the most delectable! I Won $100 Worth of Cheese! Today, as I was working diligently on curriculum development, I received a phone call from the Holland Shopping Center.”Hello, you have won $100 worth of cheese,” a friendly voice said. The grey day outside suddenly seemed brighter and the month of March a little less dreary. I remembered lamenting to my mother only a couple of days ago that I guess I hadn’t won the draw prize from one of our favourite shops. Both of us were very delighted and surprised to find out I was wrong. The Holland Shopping Center is an oasis for those of us with Dutch heritage who yearn for the kind of products we only tend to see on the rare occasions when we get back to The Netherlands. They have products that go far beyond wooden shoes: high quality dish clothes, blue and white tiles, liquorice both salty and sweet varieties, stroop waffles, and, of course, cheese! 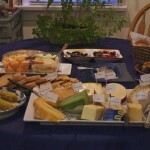 After getting over my initial excitement, I realized that I must have a Dutch cheese party and include my competitor. I will be happy to watch her enjoy some cheese, even if she is tempted to pair it with whine. Just kidding, M.
So, watch this space for cheese photos in the weeks to come and my review of West is West later this week.